Edinburgh boxer Lewis Benson today revealed that the support of his friends and family convinced him he has a future in the sport. A controversial 96-95 defeat by Northern Irishman Tyrone McKenna in November, his second loss in five months, appeared to spell the end of his career as the 27-year-old announced his intention to retire with immediate effect. 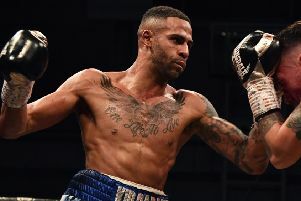 The former Scottish and British amateur champion made his feelings known on live TV as he stepped out of the ring and said goodbye to a sport he has adored since he was a young boy. However, you can’t keep a good man down and Benson, who represented Scotland at the 2014 Commonwealth Games, will make his return tomorrow night with the bit between his teeth. Hungarian Zoltan Szabo now stands between the welterweight and his 11th victory at Glasgow’s Emirates Arena. “I had a good chat with my coach Terry [McCormack] and the guys at MTK,” Benson explained. “They really pushed for me not to give up and they came back with a plan that really excited me. I took some time out to have a think about things. I just couldn’t believe I didn’t get the decision against McKenna. I was so angry. I didn’t want to quit but we had discussed before the fight that if I couldn’t beat Tyrone McKenna then I’d give up. But I got done over badly that night and everyone knows it. “I love the sport too much to stop and I wouldn’t be myself without it. I’m only 27. I got offered a nice plan back in so it was no-brainer to start training again. I’d be kicking myself in years to come if I had allowed my stubbornness to get the better of me. Benson admits he hasn’t had to make wholesale changes as he aims to seal his first win since December 2017. He expects a stiff test from an opponent who has had his hand raised on 25 occasions, although the Eastern European was stopped by Edinburgh super lightweight Jason Easton at Meadowbank two years ago. “I’m making improvements all the time. We’re looking to push on straight away. There’s not that many adjustments that have to be made to be honest,” Benson said. “I know that I’m not the finished article but I’m getting better all the time. “I cannot afford to lose tomorrow with what happened in my last two fights. But Szabo isn’t a pushover by any means so it will be a tough fight. I’m hoping to fight for a title before the summer. I know I have MTK fighting my corner and they expect big things from me. I’d hate not to have had the opportunity to win a title as a pro. I know I’m capable of doing it. “I’ve not had a drink this year. I was at a friend’s 30th recently and 11pm came and I was gone. I just went to show face. I’m not interested in anything else at the moment so my boxing comes first.